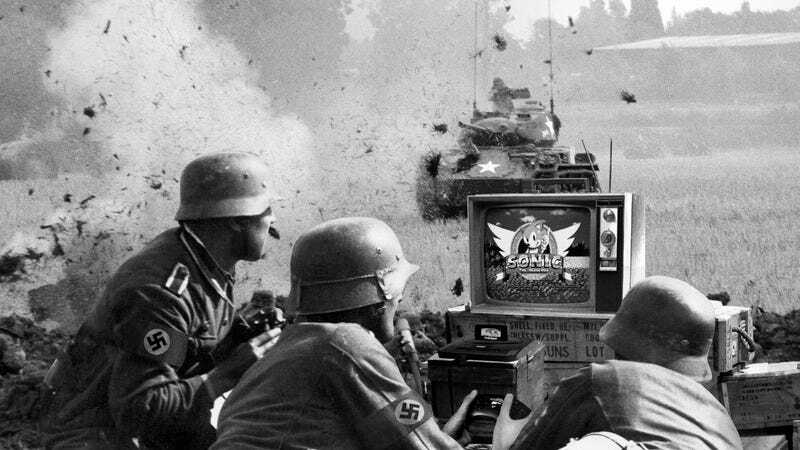 It’s so often that corporations sweep their dark histories under the rug, but one company is finally stepping up to take responsibility for its past: Sega has issued a formal apology for the role it played in supplying Sonic The Hedgehog games to Nazi soldiers. From the years 1928-45, Sega was the principal video game supplier of the Third Reich, providing millions of copies of their classic “Sonic The Hedgehog” game for SS soldiers to play on their personal Sega Genesis devices. While the company tried to distance itself from its Nazi roots after the end of World War II, it never officially apologized for contributing to the Nazi war machine by raising troop morale with Sonic’s adrenaline-pumping quest to collect all seven Chaos Emeralds. And though the brand has had no affiliation with Nazis for over 70 years, photographs of Hitler Youth arguing over which one of them got to use the good controller to play Sonic have been circulating for decades without ever being officially addressed. As recently as the ’90s, Sega remained silent about the recruiting power that Sonic The Hedgehog provided the Nazis, who encouraged people to enlist so they could come hang in the SS barracks and unwind by playing as Tails or Knuckles in Sonic’s multiplayer mode. Even after watchdog groups unearthed old Sega advertisements reading “Sonic The Hedgehog: The Aryan Choice For Leisure” and “Argentina won’t extradite, and neither will Sonic!” Sega still refused to publicly address its controversial connections. In addition to the apology, Sega has promised to erase Hitler’s official high score, as well as any other save files under the initials “A.H.” The company will also be donating a Sega Dreamcast to the Anne Frank museum. Wow. Owning up to the past is never easy, but it’s good to see Sega doing the right thing. Here’s hoping this apology brings some closure to the Nazis’ victims and their families.